This casual class is designed to open up your body and free your movement. Begin the class with a deep stretching session, and then feel free to pop on socks (OR your heels and knee pads) for some soft flowing choreography and floor work. Learn a range of flowing and lyrical transitions with sassy movements around the pole and on the floor. Each week you will learn a new mini choreographed routine. Need to work on your flexibility? This is the class to do it! All levels of flexibility can enjoy this one-hour class, full of deep stretches, long holds and partner stretches. Flexibility is extremely important for every pole dancer so this class will help open up your body to master those tricky shapes on the pole. It is a fantastic class for any dancer wanting to get bendy AND is suitable for those without pole or dance experience. Includes training to work towards splits and bridges every class. Beginner friendly! Get your heels, leg warmers and knee pads on for this 1 hour dance class full of moves to completely work your tummy, bum, core and thighs! Isolations, pops and rolls, exotic style dance moves and basic spins combined with a good strong beat. A one hour pole dance workout class for any age or fitness level. Do something for yourself with no baby sitter required. 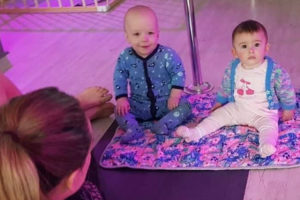 The weekly dance fitness session designed to get you moving and building strength in a safe environment with other mums. This class will allow new mums to introduce their bodies back into training at a gentle pace, with progressions for those further advanced. The last 10 minutes of class, learn some great exercises you can do at home with your bub and a gentle cool down stretch as a group. After class 15 minutes will be allocated for baby play and mums catch up time and optional tea and coffee. All fitness levels and ages are welcome to participate. • Studio opens at 9:15am for mums and bubs to get a park, settle in, feed etc. Start your weekend right with this one-hour casual strength class! This is the ultimate class to build your muscle tone, fitness for pole dancing skills. Pole Boot Camp is a whole body work out and is fantastic for all pole and fitness levels. Blair will have you working hard and achieving those goals in no time! Grab your exercise buddy and come join in for this amazing morning session! Ever wanted to learn how to do a handstand, elbow stand, bridge or pole acro skills? This class gives you step by step instructions for the correct technique for Handstands and Head stands. How to transfer your weight correctly, engage the right muscles and master balance and placement. Pre-requisite: Students attending this class must be able to execute 1 correct pushup.